Salem, and other local communities like Lynn, Lawrence, and Lowell were once hotbeds of the world of professional boxing and wrestling. Some of the posters from those events survive on various websites and in private collections. We found this card from March, 14, 1932 on an auction site. The North Street Rink, later the North Street Arena, which was razed in 1951 so that the North Street overpass could be built, was for many years the home for all things gladiatorial in Salem. The night featured four fights involving some very experienced boxers and some who were making their ring debut. The top of the card, the main event featured “Lowell” Bobby Brown, whose real name was Charles Robert Bomil. 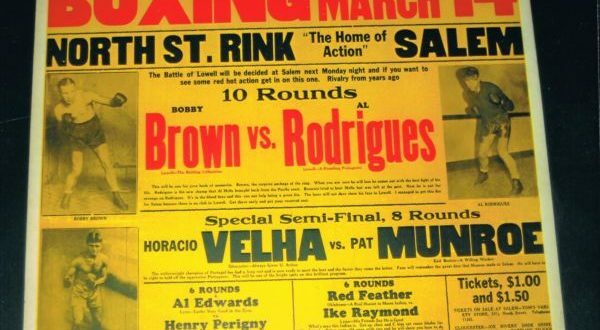 Brown was a Lowell born middleweight who would win seven of his 12 Salem fights. He compiled a career record of 47-44-2 between 1924 and 1936. His opponent was Al Rodrigues (photo right) from Quincy. Rodrigues fought as a light-heavyweight and would fight twice in Salem. He was 12-6-2 in his three year career which ended in 1934. Their fight went the full 10 rounds and Rodrigues was awarded the win on points. They fought again two weeks later and Rodrigues once again was the victor on points. The special semi-final involved a middleweight, Horacio Velha (photo left) out of Gloucester who fought against Val Nadeau a welterweight, who also fought as Young Nadeau. Nadeau hailed from Somersworth, New Hampshire. Pat Munroe, the original scheduled opponent did not fight. These were two experienced fighters. Velha in an 11-year career had a record of 55-26-5 with 21 knockouts. 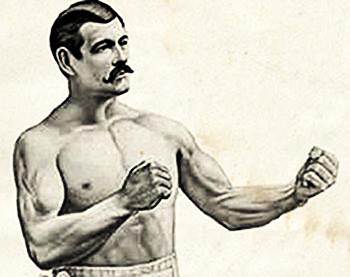 In all he fought 32 times in Salem and won 20 of the fights. Nadeau, a lefty who fought from 1925-1941 had a career record of 27-36-7. He would fight twice in Salem, both time against Velha, and would lose both on points. The first loss was in eight rounds and the second time, which was on this card he lost in 10 rounds although the card calls for an 8 round bout. The third bout was between welterweights Al Edwards and Henry Perigny, or so it would appear from the card. The ring record however indicates the it was Henry’s brother Herb who actually laced up the gloves for this one. Perigny only fought twice in his career, both at the North Street Rink and went 1-1. Edwards, who lost this fight after 4 rounds on points never again had a professional fight. 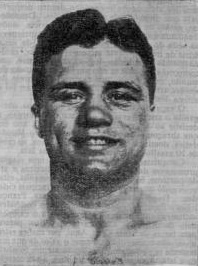 Perignys brother Henry would have his only fight on January 16, 1933 in Salem. He would win a second round TKO over Flash Donovan who would also never fight again. Last but not least was bout between featherweights Owen Red Feather from Oklahoma, and Ike Raymond from parts unknown. 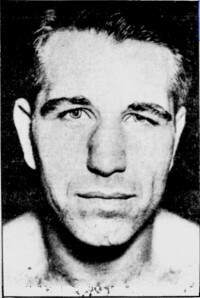 Red Feather who compiled a career record of 4-6 out pointed Raymond in four rounds. That was it for Ike’s boxing career, one and done. So there you have it. A single night from the Salem fight scene in March of 1932. We may do this again.